Clarksville, TN – Austin Peay State University’s baseball team first baseman Dre Gleason had four hits and a career-high seven RBI, leading the Governors to a 21-8 rout of Middle Tennessee, Tuesday night at Raymond C. Hand Park. Trailing by a run entering the bottom of the first, Austin Peay (5-3) wasted little time getting its offense in gear. After a leadoff walk and one-out hit batsman, Gleason got his day started with a two-out, two-run double past the first baseman. Left fielder Alex Robles would follow with a run-scoring single and the Govs opened up a 3-1 lead. The Governors piled on another six runs in the third inning, Gleason delivering the biggest blow of the frame with a three-run home run after the first two batters were walked. Austin Peay’s next three runs came on two wild pitches and a sacrifice fly to extend the advantage to 9-1. Middle Tennessee (3-5) would push the Govs in the fifth and sixth frames. The Blue Raiders plated five runs in the fifth inning, two via Governors errors and another two coming on first baseman Aaron Aucker’s home run. MTSU closed the gap further with two runs in the sixth, including Aucker’s RBI single. But Austin Peay head coach Travis Janssen gathered his troops in the dugout and the message resounded clearly as the Govs got a run back in the sixth before breaking the game open with a nine-run seventh inning and closing the scoring with two runs in the eighth. The Govs nine-run seventh frame lasted 49 minutes and saw 15 batters take a turn. Second baseman Garrett Giovannelli had a double to start the frame and added another double later in the inning. Center fielder Imani Willis and pinch hitter Malcolm Tipler hit back-to-back home runs in the frame as the Govs extended their lead to 19-8. Austin Peay starter Josh Rye (2-0) recovered from allowing a home run in the first inning to pick up the win in a three-inning outing that saw him allow two hits and a walk while striking out five. Gleason finished the day 4-for-5 with a double, home run and seven RBI with each of his four hits supplying a run. Three Govs finished with three-hit outings while another three had two hits each as the Govs pounded out 22 hits. In that 22-hit total the Govs hit four home runs, bringing their season total to 22 in the season’s first eight games. 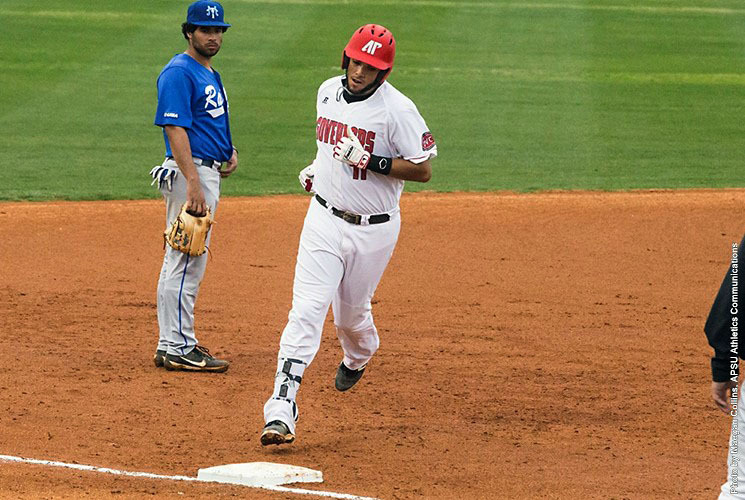 Austin Peay also hit a program record-tying nine doubles, nearly doubling their total for the season. Middle Tennessee starter Devin Conn (1-1) suffered the loss after allowing six runs on four hits and three walks in two-plus innings. Aucker ended the day 2-for-4 with three RBI while third baseman Drew Huff went 3-for-5 with three RBI to pace the Blue Raiders 10-hit outing. The Govs, who entered the day leading Division I in home runs per game, launched four home runs in the first game of their four-game homestand. Gleason hit his season’s fourth home run while center fielder Imani Willis hit his second. Shortstop Max Remy and pinch hitter Malcolm Tipler also hit their first collegiate home runs. They also were the 10th and 11th Govs to hit a home run in the season’s first eight games. Those four home runs pushed the Govs to 22 home runs as a team this season. They are averaging 2.75 round-trippers per game despite no single player having more than four home runs – Gleason and right fielder Chase Hamilton. The Govs also notched nine doubles on the night – hit by seven different Governors. That tied the Govs single-game record set in 2004 against UT Martin. Left fielder Alex Robles and second baseman Garrett Giovannelli each had two doubles. Gleason’s seven RBI in game were the most by a Governor since Logan Gray‘s seven-RBI outing at Southeast Missouri during the 2015 season. On any other night, a three RBI outing would stand out, but Robles and center fielder Imani Willis were left as bridesmaids on Gleason’s career night. Still, both Robles and Willis tied their career high with three RBI each. The Govs nine-run seventh inning took 49 minutes to complete and saw 15 batters come to the plate. Giovannelli doubled to start the frame then added another double in his second turn at the plate. The nine runs were more than the Govs had scored in any inning all season – they had only scored nine runs in the fourth inning through seven games entering the night. Austin Peay went the season’s first seven games without hitting a sacrifice fly, not surprising given the team’s prodigious home run total. However, that streak came to an end with Imani Willis‘ sacrifice fly in the third inning, Tuesday. Austin Peay continues its four-game homestand when it hosts Mercer in a three-game series, beginning with a 6:00pm, Friday contest. It will be a matchup between two of Division I top three teams in home runs per game.